I’ll give full credit to the Seattle Police Department for releasing the videos of this horrific event quickly. Especially in the highly charged anti-police atmosphere that American officers are facing today, the decision to put this event on “front street” is the fastest and easiest way to quell any rumors or allow anti-police rhetoric to gain traction. America has changed! There are over 60 million more people in the country, and yes that means more opportunities for people to choose crime and for those people to interact with police. Despite this fact, overall crime and violent crime are decreasing to levels not seen since 50 years ago. However, that does not fit the media’s profiteering narrative so it rarely gets broadcast, or is so underplayed that it is hidden in the hype. Sensationalism rules! Be sure to read to the bottom where I’ll discuss “LESSONS LEARNED” from this event. From the beginning of this call officers knew they could be facing a potentially deadly confrontation. However, at the onset officers had to be prepared for something as innocuous as a lawful CCW permit holder entering a coffee shop after a lunch break run as well. These types of calls require the most keen observations and decision-making ability by the officers. These calls are some of the most trying an officer can face. The obvious threat from a firearm is always present, but so is the Constitutionally protected freedoms of the citizen. Though he may have appeared nervous to the store employees, and was observed touching a handgun in his coat pocket, the information to that point did not even confirm that a crime had been committed. The State of Washington, like every State in the country, has laws that allow citizens to carry concealed firearms. Though carrying a firearm in an outer coat pocket is not advisable, if the man possessed a CCW permit there would be nothing illegal about that activity. 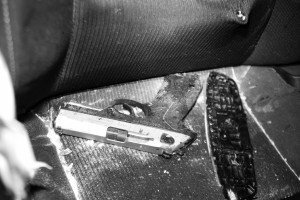 The handling of the firearm could have easily been a concern by the “suspect”, that the handgun had shifted in the pocket, and he was attempting to ensure that it didn’t fall out or become visible. Here a concealed firearm is revealed when the sweater inadvertently moves out-of-the-way. Had officers been close by and contacted the man at the first store, they would have been legally required to approach the situation as a suspicious person with a firearm, and not as an armed robber call. The importance of waiting for back-up officers, observing from cover (if possible), approaching with caution, and maintaining contact and cover responsibilities are highlighted by the start of this call. However, once the man left the coffee shop and started brandishing his firearm at other businesses, the call changed completely. This was now a person threatening innocent civilians with a deadly weapon. Though he had not fired his weapons yet, prudence and the law would allow officers to confront this man with weapons drawn in preparation for deadly force. After the armed carjackings (armed robbery), officers could legally engage the suspect with deadly force, and be in complete compliance with Constitutional law. 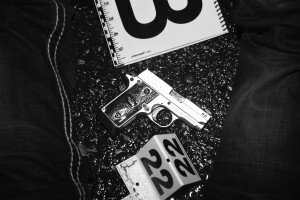 In Tennessee v. Garner, the U.S. Supreme Court established that deadly force against fleeing felons (armed robbery) by police officers was allowed only when there was reasonable belief that the suspect posed an immediate threat to officers, or the community. In Garner, officers shot and killed a burglar as he fled a house, but had no articulation that led them to believe he was armed or dangerous. If officers opted to use deadly force on the fleeing felon, a warning to the suspect of that action should be attempted, if practical. This legal concept would become a pivotal part of this event, and should be thoroughly understood by police officers. By the time officers caught up to the suspect he had brandished his firearms at two businesses, and committed three armed robberies (carjackings). In addition, these crimes were being committed in an ongoing series, posing a significant threat to the community. Considering the fact the suspect fled from marked police cruisers in active pursuit, and engaged the officers with gunfire, precluded the need for officers to “warn” the suspect that deadly force would be used against him. Ultimately then, the actions of the officers will fall under Graham v. Connor, or the U.S. Supreme Court’s reasonableness test. In this case, video from the cars and officers will undoubtedly justify the officers’ actions to end this threat. Police received their first call about the suspect from staff at Storyville Coffee in the 90 block of Pike Street around 12:35 PM. The suspect reportedly entered the store, visibly sweating and acting nervously. He began manipulating a handgun in his pocket, leading employees to call 911. The suspect exited the shop before police arrived and was next seen at the Turkish Delight restaurant in the 1900 block of Pike Place a few minutes later. There, he spoke briefly with employees before he brandished a handgun at the restaurant’s owner and fled. One of the suspect’s pistols is a Sig Sauer P938 AG in 9mm (photo by Seattle PD). The man then entered Quicksilver in the 2000 block of 1st Avenue and ran to the back of the store where an employee confronted him. Again, the suspect flashed a handgun at an employee and fled the store to the Under the Needle tattoo shop in the 2100 block of 2nd Avenue. The suspect brandished two handguns at employees and demanded to be directed to the back door of the business. He then fled into an alley behind the tattoo shop where he ordered the driver of a red Volkswagen Golf out of his vehicle at gunpoint. The suspect drove the Volkswagen to the UW Athletic Center in the 3800 block of Montlake Boulevard NE, arriving around 1:25 PM. He confronted a man in the lobby of the center and forced him to relinquish his red minivan. The suspect headed north to a Shell gas station in the 800 block of NE 65th Street where he attempted to steal a woman’s Mercedes at gunpoint. The woman ran from the suspect, who again fled in the red minivan. He then drove to a car rental lot in the 5700 block of Roosevelt Way NE, where he stole a Chevy Camaro from two employees at gunpoint. At this point, officers were able to locate the suspect driving the Camaro and began pursuing him through Northeast Seattle. After following the suspect as he drove northbound on a southbound-only section of Roosevelt Way NE, one officer attempted to disable the suspect’s vehicle by ramming it near Roosevelt and NE 45th Street. Dashcam video of the jarring collision shows an officer slamming his patrol car into the suspect’s vehicle, crushing the patrol car’s front end and pushing the Camaro into the intersection. Although the force of the crash disabled the officer’s patrol car, he can be seen on video exiting his vehicle and attempting to chase after the suspect’s stolen Camaro on foot as it speeds away. The other is a Berreta PX4 Storm Compact in 9mm (photo by Seattle PD). As the chase continued through North Seattle, the suspect fired on pursuing officers. The pursuit ended in the Wedgwood neighborhood, where officers collided head-on with the suspect’s Camaro at NE 68th Street and 35th Avenue NE. An uninvolved motorist’s SUV was also struck during the incident. The SUV’s female driver was able to flee to safety as police took up positions behind their patrol cars. The suspect reportedly pointed his gun at officers and began maneuvering the Camaro towards police, who opened fire. SWAT officers approached the suspect and fired. The suspect died at the scene, with two guns found in his possession. Police are reviewing all force used in the incident per department protocols developed with the Monitoring Team and the Department of Justice. SPD is also working with the Bureau of Alcohol Tobacco and Firearms to trace the suspect’s handguns. Police have also recovered several shell casings, believed to be from rounds fired by the suspect during the pursuit and are working to confirm the connection through forensic science. The mock scenarios such as this, and allow themselves to think through their responses and justifications for those responses. By working through the problems in advanced, officers will have established a series of memory actions that their current mind can draw upon in a live event to steer the officer to success. 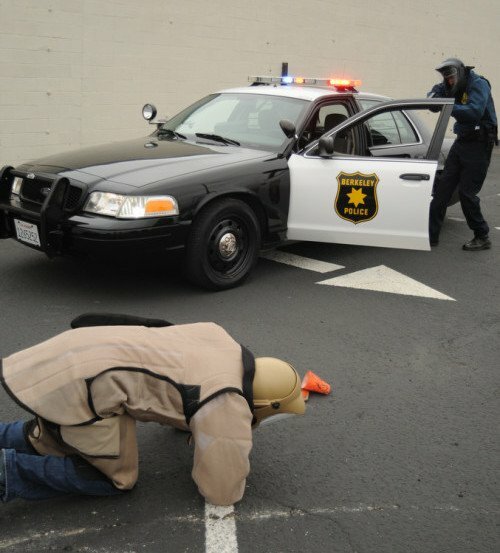 Police force-on-force (RBT) training is key to successful deadly force encounters, but mental preparation can be done anytime. If officers fail to prepare themselves, and rely solely upon Academy or in-service training, they are setting themselves up for failure. Simply waiting for a call, or only thinking about a situation when confronted with one, is a recipe for disaster. Many law enforcement training organizations emphasize that officers should be at Condition Yellow (fully aware, but relaxed) at all times – on and off-duty. This state of mental awareness should not simply rely on our current observations, but should include previous mental exercises that keep our decision-making processes sharp. Our minds are amazing structures, but they are also quick to move the now into long-term memory. That memory takes a lot longer to access then the memory that is fresh in our minds. When officers think about scenarios, and walk themselves through what they would have done (and why), they keep those skills in the short-term memory that can be accessed very quickly. When fractions of seconds mean the difference between life and death, we owe it to ourselves, our families, our partners, and our community to be highly prepared. The Seattle Police responded to a very dangerous incident, and their actions were heroic in ending the threat. In several incidences, officers took personal initiative to attempt to stop the armed suspect. In the end, a coordinated move by multiple officers stopped the suspect. This was a rapidly evolving threat to a large metropolitan police force. Seattle have (6) Patrol Divisions, and fields dozens of officers at anyone time. The King County Sheriff’s Office also has numerous deputies in close proximity. Even still, it took nearly an hour and a half to locate the suspect and directly try to stop his actions. Is your department prepared for a committed, serial criminal on a path of destruction. Do you have mutual aid agreements in place with other law enforcement agencies? Does your department actively seek community assistance through social media? Do you have a good working relationship with traditional media outlets? Are your Use of Force policies up-to-date with Constitutional case-law? Does your department provide officers authority to act on their own? What kind of lethal force weapons or options are available to each officer? Are you trained with Stop Sticks are Spike Strips? What are your policies for forcible stop techniques, and lethal force at vehicles? If your department does not have solid answers to these questions, then you need to push for better guidance and tools to be able to properly respond to an event like this. The entire country is aware of Active Shooter situations, and has largely taken a very proactive role in training (and equipping) officers to respond to such a threat. This has been pivotal to greater responses by law enforcement in recent years, whether from large agencies or smaller ones. This same mindset has to be implemented in other “Active” criminal events. Though this event occurred in a major metropolitan area, it legitimately could happen anywhere. I work in a major metropolitan area, and recently we suffered a string of vehicle thefts, burglaries, and thefts from auto. We developed suspect information that led to the middle of the State and a County with a total population of 9,305 (about what one of our 10 Patrol districts has). That Sheriff’s Department (6 total employees, including the Sheriff) followed-up on the leads we provided and ultimately got into a high-speed chase with the suspects, that involved at least one carjacking, and ultimately a forced crash and shoot-out. Once the first patrol officer engaged in a pursuit, several decisions must be continually evaluated. This event is pretty straight-forward – armed man has brandished firearms repeatedly, and committed at least 3 armed robberies. The threat level is very high, and police action is expected – with little discretion. At that point the suspect could have driven or acted in a manner that would have been so dangerous to the community that officers would have had to decide whether the risks of pursuit outweighed the risks to the community. However, once the suspect started shooting (here at police, but any shooting applies) the police are tied to him until completion. Police cannot allow armed, actively violent felons to be free in society. The threat by the suspect opens all sorts of doors for police action. In what appears to be a deliberately carried out action, the officer rams the suspect vehicle in an attempt to disable it. It cannot be emphasized that this officer’s actions came about even before the first confirmed shots by the suspect. The officer clearly recognized the immediate violent threat to the public, and took an action that was available to him. Unfortunately, the officer’s vehicle is disabled, and the suspect is still able to flee. In the video a new police cruiser can be seen immediately re-engaging the suspect in pursuit. Ram where speeds will not present undue dangers to innocent civilians. Know the dangers and limitations of Stop Sticks or Spike strips. As the pursuit continues, the suspect can be seen shooting at officers. This is just a confirmation of the need to take immediate action to stop this violent predator! The pursuit continues into on-coming traffic – a common technique of committed fleeing criminals. In many incidences this would require the pursuit to cease, likely what this robber believed would happen. Officers must be trained and prepared to differentiate criminal acts that require a continued pursuit even under these extremely dangerous situations. Finally as multiple police vehicles close in, an unmarked police vehicle steers into the path of the Camaro to ram it head on and end the suspect’s mobility. Amazingly, the suspect is not finished. Officers reported that he pointed a handgun in their direction, and then gunned the Camaro’s engine. It is unknown if he was simply trying to escape or driving towards officers, but regardless, his actions are clearly very dangerous. Nearly a dozen officers open fire on the suspect ending his threat. If you’re in a crossfire – MOVE! Be ready for TCCC – it could save your life, or your partner’s! 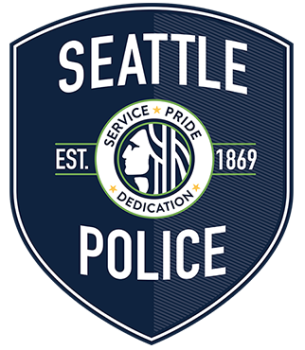 Ultimately the actions of the Seattle Police Department officers successfully ended an extremely dangerous event and person. The quick thinking, and ability of individual officers to think and act outside of the box was paramount to the successful conclusion. Though the lessons I’ve pointed out are important, they are minor critiques of an otherwise excellent show of police action. Are you and your department prepared?